Rather than regurgitate what has already been published, we prefer to post what we think are the best informative links on the topic of herbs and other ingredients, and post essays with additional lore and practices of active witches. We like this list because it is organized, easy to read, and contains both common and not so common information about the use of herbs. It also invites users to add comments and more information, so it stays relevant. A very well organized listing of plants with their medicinal and traditional names and uses. 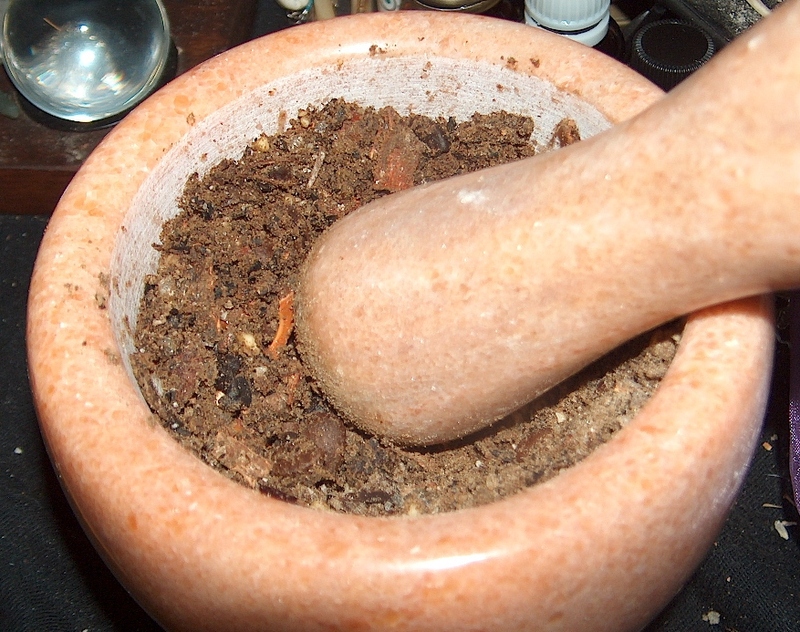 An alphabetical list of herbs, stones, and other ingredients used in Kindoki, Brujeria, and other Afro Hispanic mysticism and magic. There is also a list of the Latin names of many plants and “palos”. We like this one because they list some herbs that are well off the beaten track, and detail both the nice and not so nice used for them. This index is a great reference for practical witches. A very good list of herbs used in Chinese medicine, with photos and usage information. It’s easy to navigate, with transliterated Chinese name and the common and botanical names. A concise, but good list of nine sacred herbs, and their medicinal and magickal uses by Raven Kaldera. The best thing about this list is that if there isn’t a previously recorded way of engaging with the plant, he gives advice on how to do so. Next time you’re facing what seems like an insurmountable problem or dilemma, try the watercress exercise. You’ll be very happy that you did. After reading this paper, “tuntre” or “vardtrad” will become important parts of your vocabulary. Aside of detailing the cultural importance of trees, it raises questions that make you think about the importance of environment in shaping us and our Ancestors, and how arrogant we may be in considering ourselves more distinct from our ecology than we are. If you’re into potion making or alchemical cooking, then this page has concise guides to the alchemical properties of a variety of foods and ingredients. If you prefer to forage and wild-harvest or just use ingredients that most urban people don’t have an energetic tolerance for, then this whole site is useful. Very little is said there about the magickal properties of things, but there is plenty on the medicinal and nutritional. Here are some of our essays and favorite pages on specific herbs. One of the most prized woods in the world of witchcraft, it has many uses, and is a plant teacher of triumph over adversity. Also called bay laurel, it helps to enhance one’s thinking and visions, even in a crisis. This article on bay leaves contains an example of a spell for helping someone to think clearly and keep it in their pants. The bauhinia flower is a symbol of harmony, but implies harmony achieved through mindful leadership. So in Japan, it is a flower of royalty. Medicinally, it is used to lower blood sugar to prevent or treat diabetes. It works so well that it has been sometimes referred to as “vegetable insulin”. To use it for this, simply make a tea of 1/4 to 1/2 gram (like a quarter to half a standard teaspoon) of the chopped or powdered, dried, young leaves 3 times a day after meals. It is very aromatic with hints of menthol. Be very careful with this, as again, it works extremely well to lower the blood sugar. You can get hypoglycemia with nosebleeds if you overuse it. Magickally, it is used to help someone to resist the effects of controlling magick, including but not limited to glamours, love spells, and bindings. Be aware that the ones with white flowers may also neutralize your own workings, while the ones with pink, reddish, or purple flowers allow you to maintain your influence while hampering or removing the effect that others’ have on you. The flowers are nice, but for magical purposes, the strongest energy is in the leaves, young pods, seeds, and bark. You can make a tea or extract of the leaves, or a tincture from those and the young pods. The seeds can be used in charm bags to prevent others from limiting you or overriding your influence. The strings in the bark can be used to form a rope with three knots to bind those who attempt to bind you. Caroline Seawright wrote an excellent essay on the ritual use of chocolate in Mesoamerica. Though it is now used more widely, it is important to know the origins of its use in spiritual practice. Underground Health also has a good article on the health benefits of raw chocolate. In magick, as in nutrition, raw cacao/cocoa beans, nibs, and powder are stronger than treated. They should only be roasted if one wishes to add more fire energy (such as when one needs charisma for sales/trading). In American and modern Vodun and related belief systems, chocolate is sacred to Oya, the Orisha of change, storms, wind, thunder, and lightning. It is also considered a royal food, and as an ingredient, it helps to increase or validate status. This very versatile herb has properties that are very rarely discussed. One of its most important is taking in the intent of its caretaker, and releasing it where it is applied. Every witch should have some on hand, and know how to use it. This is a widely used herb in west Africa and the diaspora that brings unity and enhances hospitality. Learn more about this herb and get a delicious recipe for kola nut cake that your guests will love. My Persian Kitchen has a good page on how to use Esfand to cleanse or protect someone from the evil eye. Esfand, also known as Esphand, Aspand, or Harmel, is often called African or Syrian rue, but it’s not rue at all. It’s Peganum harmala. According to Erowid, it is psychoactive and should be used very carefully. If one uses it in sufficient dosage to enhance trance or seidh/movement ceremonies, three days to a week of raw, clean diet with no fermented foods whatsoever, and a day of water-only fasting is recommended. After, continue a raw diet for another three days. Pregnant women and women attempting to conceive shouldn’t use it at all because it can cause an abortion. In men it can reduce fertility. It also increases the blood pressure, so it can be helpful for those recovering from problems that slowed the metabolism. It is also used to purge the body of parasites, especially tapeworm. Similar uses may be why this was called “rue” when it isn’t. These are the clumps of hair and secretions from male deer who rub against things and shed during the mating season. Deer musk is mostly used for attraction, increasing virility and masculine energy, and for status concerns. It is used a lot by men, because women are attracted to it, but it also helps women to feel more attractive and sexual. The use of natural deer musk is very rare in practical witchcraft because it is extremely expensive to buy ready-made, and it takes so much time to make it yourself (instructions @Zindoki.com). It is worth it though. I can say from personal experience that once I had matured an experimental teaspoon grains:10 ml. alcohol vial of tincture for a year, I wished I had made more from the start. Not only does it smell wonderful, but a little goes a long way, and it works like a charm. This is an excellent article on the medicinal properties of the hawthorn berry, also known as the thorn apple. There is also an article on its magical uses. Not mentioned on their site, it is also important to know that its circulation enhancing properties also make it good for virility. It is especially helpful in this way to diabetics and older gentlemen. Long pepper, also called Balinese pepper, and sometimes Eshu’s pepper is a very useful herb in protection and love workings. I find it hotter but sweeter than black pepper. If you’ll be using cinnamon, nutmeg, ginger, tumeric, or galangal, you may find it more compatible. It is very useful when one has “dark” works to do that one wishes to be profitable for one’s self or one’s client. Its energy is more shrewdness, not self annihilating. So it may not be appropriate foe vengeance, but would work for winning a court case or getting a lighter sentence. Mango fruit is nutritious and delicious. It has lots of vitamin A, reduces bad cholesterol, and is said to help prevent some cancers. The tree is sacred to Buddha and is said to be a good offering to any of the west African Orishas. Mango is originally from India, but became well loved in Africa once it arrived. Mango leaves have many magickal and medicinal benefits. Both the fruit and leaves help to clean and strengthen the veins. The leaves are especially useful in balancing the pancreas. In magick, mango leaves are used for increasing harmony, balance, and a sense of contentment, especially in marriages. The juice facilitates love and fertility. This is because of the vitamin E and other beneficial compounds, as well as the energy of the plant itself. The dried skin and twigs are used for protection, but must be handled with care because the sap causes a terrible burning rash, and is very difficult to rinse off before it has done some damage. If Jasminum Sambac is the king of fragrances, then Osmanthus Fragrans is the queen. It’s used in food, medicine, and magic. In workings and concoctions, it’s flowers or flower absolute or essential oil are mainly used for marital type love, loyalty, and consistency. Its bark and lateral roots are also used for healing. It may be hard to find in some places, but it is worth the search, especially if you are Moon/Osu oriented and doing moon magic. Peaches are used as offerings, and for youth and protection. In some streams of North American Voodoo and Rootwork, before mangoes were widely available, peaches were used as an alternative offering. This plant is best known for its many seeded fruit, but just about all of its parts are useful in medicine and witchcraft, from the roots to the flowers. It is associated withe feminine underworld energies and deities such as Persephone and Yewa. Its roots are antiparasitic, and its flowers are antidiabetic. Its fruit is good for health overall, but especially the heart. Pomegranate juice is purported to be satisfying to vampires when mammal blood is unavailable or inappropriate. It is also used for fertility and balancing the hormones in women. The rind and leaves are ingredients in some magickal inks. Click here for a recipe for a durable pomegranate ink. Spice Pages has a very good article on rue. This is a very widely used herb that is, like Esfand, used against the evil eye and other negative energy. It is also used medicinally to bring on menstruation or ensure regular and less painful menstruation in very small doses. Ethiopians use it as an ingredient in their famous spice mix, berbere, and to flavor coffee. Lucky Mojo has a pretty good page on the magical use of rue in love and protection spells. alchemy, concoctions, herb lore, herbs used in witchcraft, how to use herbs, ingredients used in witchcraft, list of herbs, list of ingredients, magical properties, magick ingredients, mystical properties, potion making, practical witchcraft, sacred herbs, witch herbs. Bookmark. I an looking for a tincture or herbs that help with severe back pain my husband suffers so bad with lower back pain. Thank you. The few plants that truly help with severe back pain are controlled substances in most places these days. However, in the spirit of free information, with the disclaimer that you should only use them if it is legal for you, my best recommendation is marijuana. Marijuana is very oil soluble, and very good as a tincture or an oil. So if you can get your husband on medical marijuana, that is the best way to go to avoid opiates. It also helps with inflammation and high blood sugar, which is often a cause of back pain or worsens it. If weed is out of the question, you may want to try conventional treatments to get through the pain so he can function, but see if other plants containing similar compounds will help with the healing and maintenance in the long term. The first that springs to mind is South African Helichrysum umbraculigerum or “vuku”. It is a visionary herb that helps some with pain management, but some find the initial “wonkiness” effects a bit distressing. Helichrysum arenarum doesn’t have the intensity, but it helps many, and is famous among Russian herbalists. They call it “bismartnik”. I have used this to help with arthritis in my knees, and it has kept me walking. There is also an Israeli helichrysum that works as well, but I forgot the full nomenclature. On the Crystal dedication page, when it mentions feeding a crystal with holy oil or water, where can I find information on what those are, and how to do that?